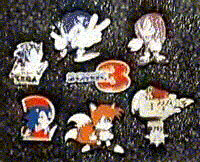 The USA did not have nearly the amount of Sonic keychains or pins as Japan did, so the section is merged. These items are all fairly sure to have been avialable to the USA Sonic fan population at one time or another. This doesn't mean they're all that easy to find, but some of these you can still get today! The selection is more modern at the bottom of this page. 4 old enamel on metal pins. The Sonic 3 one is rumored to be a pre-order bonus item for the Sonic 3 game on the Genisis. The "Sega is #1" is the oldest of the set. The American Flag holding Sonic is uncommon. A mixed-up pin collection. This contains pins from different sets and times. 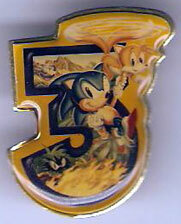 The Sonic3 pin, you can recognize from the special Sonic 3 Japanese pin pack. The eggman with his spike-ball is a varient on a design which appears on a Japanese patch. The Knuckles design has the un-attractive vertical eyes stock art common to European items. 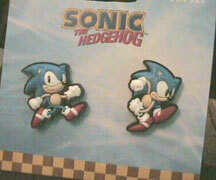 A close-up of the above Sonic 2 pin. A real classic pin. Sonic shown in one of his first poses. Notice that his nose is flesh-tone like the bottom half of his face. Was this an accident? Or did someone accidentally chip the enamel of this pin? You can see this enamel pin above, but this shot will get you the detail. It's surprising really what they could fit onto the tiny pin. It's exactly like the USA box art complete with tiny egg-o-matic in the way background. This is a great pin to collect with some really superior detail. Technically a dog tag is not a keychain or a pin. 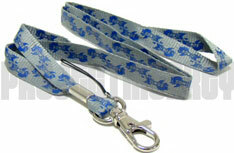 However, many people used them as key chains rather then wearing a clunky tag about. This one is a Sonic Adventure 1 promo item. Notice the quality rubber case, to guard the user from sharp metal edges. Flat rubber keychains for Sonic X. These have great detail and a really nice cell-shaded look. There IS a Tails one, but Hot Topic does not carry it. All of these key chains are available right now in the SonicGear Sonic Store. These ARE currently available at Hot Topic stores: retailers of pop culture & band t shirts. You can get to HotTopic with the link at the top right of this page. 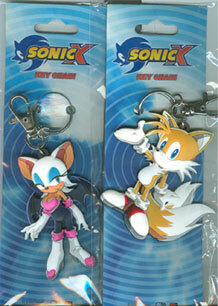 Tails and Rouge are now in your collectible keychain line-up! These are such nice die-cut keychains, the detail is like an animation cell, and the colors are all spot-on. These are appearing in Hot Topic stores right now! (if you have a bunch of Sonics in your Hot Topic, they may not have these guys in yet.) Keep shopping though! 2 simple enamel and metal pins. 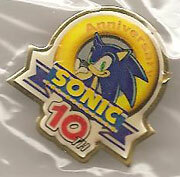 The first was a Sonic 2 Release promo pin, unusual because it only has his name, and no image of Sonic. The other could be a bit older, with a regular Sonic leaping over the "SEGA" symbol. The angle does not show you if the name is enameled as well. A promotional Key ring for Sonic Adventure 1. Made of flat white rubber and stamped with the common SA pose Sonic. Beware of this type of chain, as it is easy to bootleg, except for the fact that it has custom-cut edges. This is probably part of a promo-pack released around SA1. 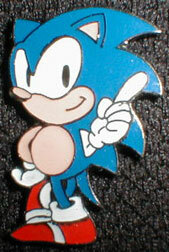 Here's a Sonic X keychain, released in 2007 by an unknown company, but currently being sold by ToyCup. Currently, it is avialable on the ToyCup website. www.ToyCup.com and also in the SonicGear Sonic Store. The figures appear to be metal with enamel on slides. Sonic is in a pose from many of the current shirts, Rouge is standing around, and Shadow is in action. You also get the "Sonic X" TV show logo. This doesn't look very large...but there is no real scale to the photo. Here are 2 more flat rubber keychains. These are the same style as the layered die cut rubber Sonic X keychains seen carded above. However, both of these are smaller. The effect is still decent though, with cut-in details and unique shapes. The first presents a sort of SA1 style Sonic in a circle, and the second has peace-sign Sonic just standing, but it comes with a fancy blue strap. The strap has the Sonic logo (modern) and what looks like a bumper from the games with an "S" on it. You can get both of these at Toys N Joys in Spring 2009. BEWARE bad customer service at Toys N Joys, you might get the items but maybe not! Read reviews before you buy! This keychain was under suspicion. 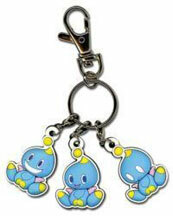 It is sold by Toylet Net , and resembles the multi-character Sonic X metal keychain/charms. However, this one features only neutral chao, and has no logo at all. The first 2 chao are normal, but the third has no dark spots in the eyes, which makes it look really strange. Why? Because the last chao is crying. There is a little tear-mark at the edge of the eye, and the keychain's name is "Chao Moods". A must have for chao fans, now that it's been proven to be an official item. GE Entertainment is getting into Sonic keychains, and that seems to be a good thing so far! They are producing the layered, cut flat rubber keychains which were popular in Hot Topic. They're also doing a good job, translating the classic styled stock arts into semi-3D cut rubber format, as seen here. 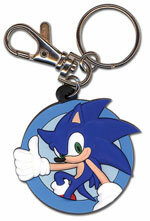 The first one is the somewhat unusual 'steamin' Sonic' stock art where he's mad (who would want an angry keychain?) this one comes with an extra clip as well as the ring. The other 2 are just heads, and can be used as a keychain/tag OR you can fit a key top in the bottom and it becomes a key-cover. 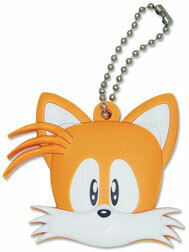 Fortunately, they're drawing on JAPAN classic Tails art, as this topper is genuinely cute. It does have a mouth, that's just difficult to see. Winking Sonic also looks nice. Discovered by Berzerker. If you liked the flat, multi-layered rubber keychains above, then you'll like these! GE Entertainment has added new poses for Knuckles and Shadow, plus Amy's here now too! Shadow and Knuckles feature more dynamic and different poses, and Amy Rose stands with her piko hammer. Each one looks to be a great rendering of the character with good sharp details and crisp cut lines thanks to the manufacture method. Do note that the self-shading from the previous ones is not used here. The keychains are to scale with eachother, though. era. Tails is sleeping on a beach towel, and the Sonic is a little-used art with him doing a trick on a skateboard. see in the small image. In all, it's a nice set and they're well designed with good detail levels. Available summer 2009. Here's a good shot of one of Toy Island's individually carded keychains. Each of these keychains features a 3D figure of the character, and were most widely available on one of the numerous re-releases of their SA1 large action figure line. Each figure was paired with it's matching keychain, except for Eggman, who had a chao instead.